Welcome to the June NC Demo Blog Hop! If you’ve hopped over from Tracie’s post, I’m sure you’ll agree that her project was great! She is an amazing artist. Thanks so much for stopping by to see my post. 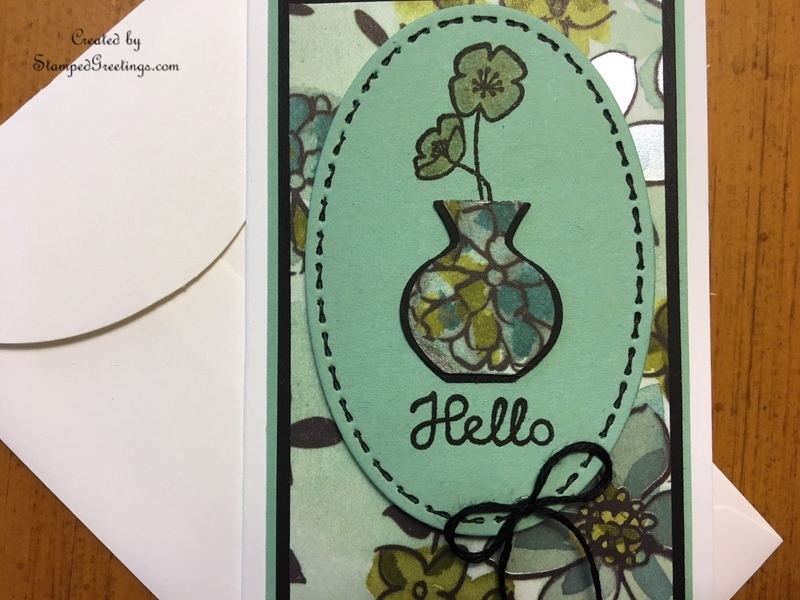 The card base is a Whisper White Narrow Note Card. The dimensions of the card are 2 1/2″ x 4 1/2″. The largest frame piece is Mint Macaron card stock cut to 2 1/4″ x 4 1/4″. The next smaller size frame piece is Basic Black card stock cut to 2 1/8″ x 4 1/8″. The next smaller size frame piece is from the Share What You Love Specialty Designer Series Paper cut to 2″ x 4″. I am willing to bet that you save scraps of Designer Series Paper. I sure do! The DSP that I used for this card were scraps from another card. Grab another piece of your scrap DSP and punch your choice of vase shape using the Vases Builder Punch. Grab a piece of scrap Basic Black card stock and punch three vases of your chosen shape. Adhere the Basic Black vases behind the DSP vase. The Basic Black vases are attached to add a small frame to the left side, right side, and bottom of the vase. 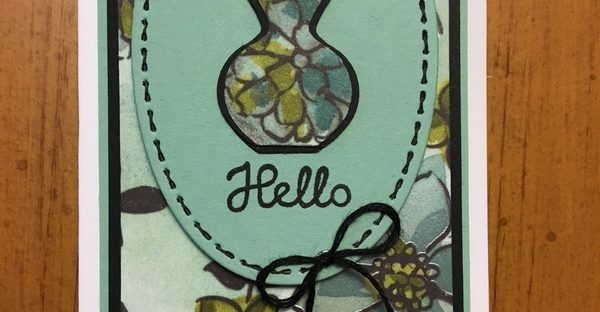 Stamp “hello” from the Varied Vases stamp set on the bottom of the die cut oval. I used Memento Black Ink to stamp. Choose the flower stamp that you want to use from the Varied Vases stamp set to add flowers to your vase. 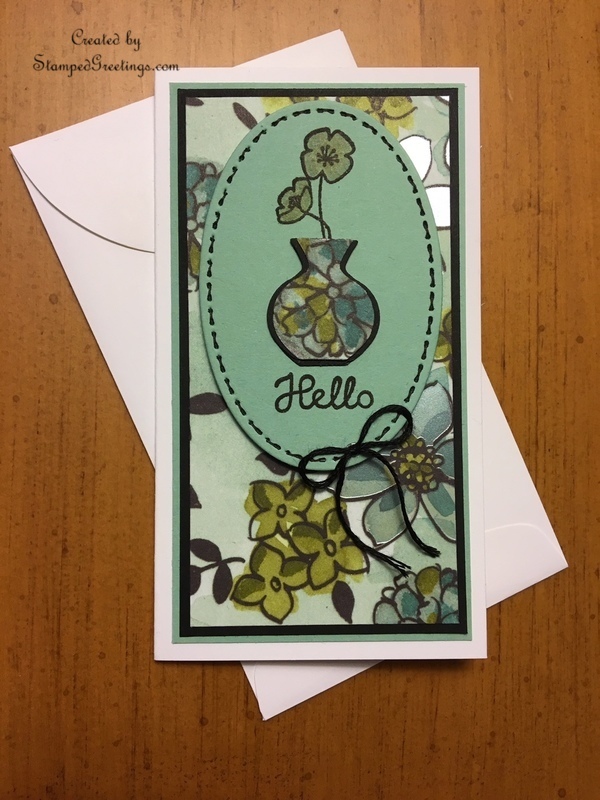 Tip: Figure out how much of the stem piece you can fit on your card but make sure the stamped stem will be hidden by the vase. I only stamped about half the stem on the flower stamp that I chose. If I had stamped the entire stem, part of the stem would be seen below the vase. Adhere the framed DSP vase over the stamped flower. Add color to the flowers with your choice of color from the Watercolor Pencils set. I used Old Olive and Pacific Point to add hint of green and blue to compliment the colors in the DSP. Add faux stitching to the die cut oval using a Basic Black Stampin’ Write Marker. To finish the “stitching”, you can also add a black twine bow to the die cut oval. The framed pieces are adhered with your favorite glue. The finished die cut oval is adhered to the card front with Dimensionals. I hope you enjoy making this card and that you’ll change the design to make it your own. The main products that I used to make the card are shown below. You can click on any picture and go directly to my on-line store. 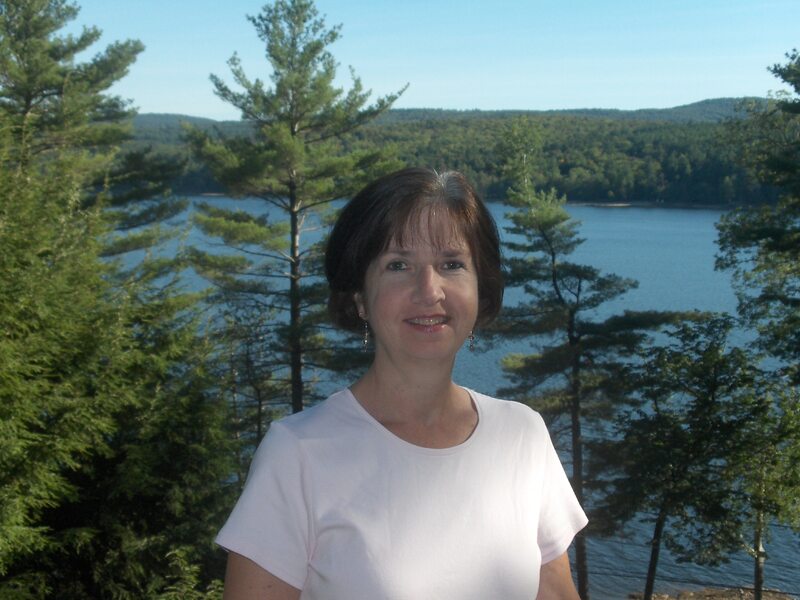 Be sure to continue your blog hop by visiting Sue’s post. I know she has an incredible project to share with us! All the artists who are part of this month’s NC Demo Blog Hop are listed below.